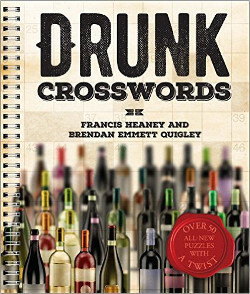 Crossword Puzzles by Brendan Emmett Quigley: CROSSWORD #219 & a contest! CROSSWORD #219 & a contest! I recently gave a lecture on mobile devices to a group of about 100 computer science students. The lecture featured the iPad and I thought that I could kill two birds with one stone by getting your name out also. Seeing that "IPAD" in the Central Processor puzzle had the effect on me that seeing Jesus in a piece of toast has on devout Christians! :-) Except in this case a crossword Jesus was telling me to buy an iPad which I did. Since the students were predominantly from countries other than the U.S. it is unlikely that any of them have ever heard of Will Shortz. They all probably imprinted on you. The students loved the iPad crossing! Hey now. That's blasphemy! We all know there's only three Crossword Jesuses out there. But, I'll take it. Especially considering this is probably the one and only time people will associate my name before Will's regarding crosswords. (Let me savor that.) And raise your hand if you didn't love the iPad crossing? (Al Sanders, put your hand down!) No matter. For his bravado, Ralph gets a copy of any book from Ye Olde BEQ Souvenir Shoppe. To everyone else: keep those fan pics rolling in. Now, about that contest. 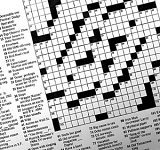 Normally, my contests require you to solve riddles embedded in a crossword grid. Not this one. It seems like there are only three theme answers in this puzzle, when in fact the fourth member of that particular group is hidden elsewhere in another answer. Your entry for the contest is that answer. Email, direct message me through Twitter, Facebook, or Buzz, call me up and tell me it if you'd like. Hell, order me some pizza from The Upper Crust and have the delivery guy tell me your answer. The deadline for entries is this Tuesday night (5/4/10) around my bed time. I will select two winners: one who had the correct entry, and one who had the most inspired method of entering the contest. The prizes for the contests, as always, is anything they want from Ye Olde BEQ Souvenir Shoppe, or something I don't want any more from my condo. Good luck to all. Finally, thanks to all who were able to contribute to this month's drive. It's not too late to hit up the tip jar. Tipping not only keeps the site running smoothly, but it also makes you feel good about your place in the puzzling community. Even if you can't tip, you can always help me out by telling just five people about this site. Free puzzles. Wiseacre commentary. How can you lose? As always, I will select one random donor to receive a complementary item from the Shoppe as a thank you. Share the puzzle. Good luck to all. New one on Monday.